See Pacific Grove in a fun new way. 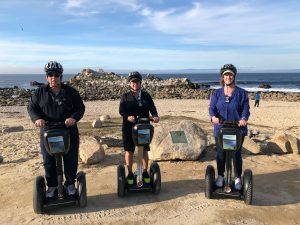 This tour has it all; history, coastline and riding the Segway PT for the fun of it! You’ll pass “Kissing Rock”, a rock formation resembling two people kissing. You’ll visit the memorial to John Denver who tragically lost his life when his experimental aircraft crashed into the bay. You’ll stop by Point Pinos Lighthouse, the oldest continuously operating lighthouse on the West coast, first lit in 1855. You’ll pass by The Pacific Grove Municipal Golf Course with fairways and greens presenting magnificent views of the coast. You’ll visit Asilomar Conference Grounds and the Phoebe Apperson Hearst Social Hall designed by famed architect Julia Morgan. Expect this Segway PT experience to take about 2 1/2 hours including training time. Reservations are required. Same day reservations may be possible. Please call 831-324- 4438 to set a reservation.